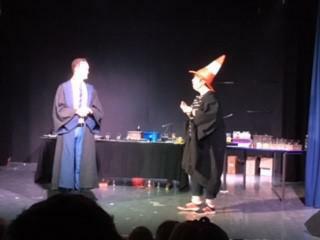 On Wednesday 8th March the year 5/6 children from Asby, Bolton and Crosby Ravensworth went with Miss Lowthian and Miss Hayton to a Science show at Windermere School. When we arrived we were given refreshments before the show started. The show was called the Chemical Magic Show which celebrated Science and Engineering. 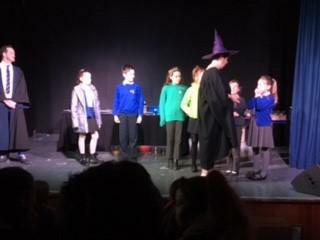 The actors were brilliant they had the children very engaged in the activities. There were experiments demonstrating let there be light where they made different solutions light up in the dark, jugs of mystery where different beakers changed colour, alchemy where coins were changed from copper 2 pence’s to silver 10 pence’s and also twenty pound notes were set alight and finally bangs and flashes where the actors set Jelly Babies alight and liquids in chronical flasks which exploded. 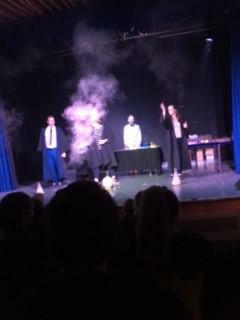 The children really enjoyed the show. We were taken into the school canteen to have our lunch some children took their own lunches and some had Spaghetti Bolognaise or Vegetable Pasta and a Muffin for pudding. During lunch we filled out a quiz about the show.